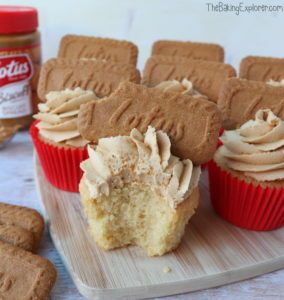 I feel like Biscoff came out of nowhere and suddenly became one of the most popular spreads and flavours out there, along with the likes of Nutella. This is not a bad thing as it’s absolutely yummy stuff and it’s another fun ingredient to experiment with when baking. 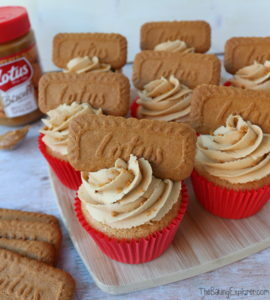 Also my boyfriend loves it, so anything I make with Biscoff I know he’ll happily devour it! I’ve created these Biscoff Cheesecake Squares which start with a layer of Lotus Biscoff biscuits, then they’re topped with creamy vanilla cheesecake which is then swirled with Biscoff cheesecake. I find making baked cheesecake in a traybake so simple to make and also really easy to portion out and serve, plus the swirled effect means there’s no additional decoration needed! To make the biscuit base I whizzed up some Lotus biscuits in the food processor, then I mixed them with melted butter and pressed into the bottom of a lined baking tin. I baked them for 10 minutes, then left them to cool. 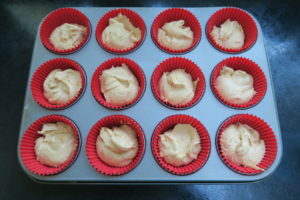 Next I made the vanilla cheesecake filling by whisking together cream cheese, eggs, sugar and vanilla. I poured it into the baking tin on top of the biscuit base. Then I made the Biscoff cheesecake filling by whisking together cream cheese, eggs, sugar and Biscoff spread. I added blobs of it all over the vanilla cheesecake. Then using a butter knife, I swirled the mixture around to create a pretty pattern. The cheesecake baked for 30 minutes, then I let it cool completely and then popped it in the fridge. The Biscoff Cheesecake Squares were so creamy and full of caramelised biscuit flavour. 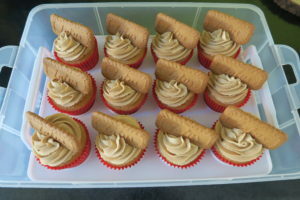 They are an absolute dream for anyone who loves Biscoff and cheesecake! The Biscoff Cheesecake Squares did not last long in my house as my friends and boyfriend are huge Biscoff fans! You can use digestive biscuits instead for the base, but the Lotus Biscoff ones really add to the Biscoff flavour so I do recommend them! NB. 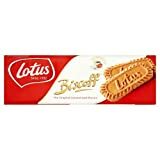 this post is NOT sponsored by Lotus Biscoff – I just love their products! It looks like I severely underestimated how much time moving into a new house takes up even after you move. I’ve been so busy recently doing very grown up things like going to the tip on Saturdays, spending scary amounts of money on furniture and attempting to pick paint colours. I had some bananas that were slowly going brown in the fruit bowl so I decided that it was the perfect excuse to fit in some baking. My boyfriend is obsessed with Lotus Biscoff spread and he loves it on sandwiches with banana. He’s been working so hard recently that I wanted to combine those flavours into a cake for him to enjoy and so I created this Biscoff & banana cake! 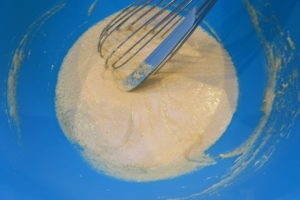 To make the sponge I started by mixing together the butter, golden caster sugar and light brown sugar. I added the eggs and vanilla extract and whisked them in, then I mixed in the mashed bananas. Finally I folded in the self raising flour and baking powder. 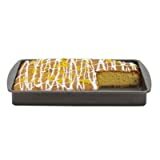 I divided the batter into three 8″ sandwich tins, and baked on 160C Fan/180C/350F/Gas Mark 4 for 25 minutes. 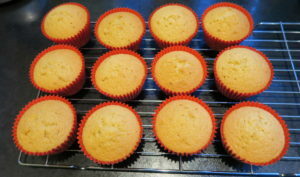 I left them to cool completely. 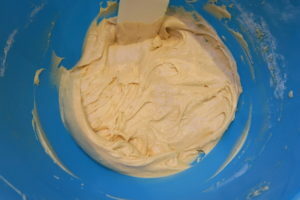 For the biscoff buttercream I started by mixing together 300g butter with 600g icing sugar. 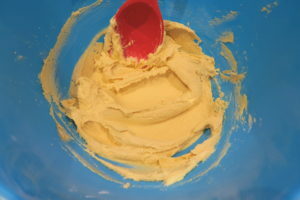 I then added 540g Lotus biscoff spread and 6 tbsp double cream and mixed it well until smooth. I put the first sponge on my turntable to start decorating, I spread on a layer of buttercream and smoothed it over. 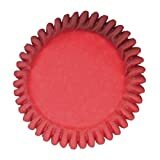 Then I sprinkled on some crushed Lotus biscuits for extra crunch between the layers, I then did the same for the next layer and then topped it with the final sponge. I covered the whole Biscoff & banana cake in a layer of the buttercream, then put it in the fridge for 30 minutes. I took it out of the fridge and smoothed on a final layer of the buttercream, I used a palette knife to make it as smooth as I could all over. I refrigerated it again for 30 mins. It was time to create the drip effect! So I tipped the Carnation caramel into a bowl and stirred it to smooth it out. I added 1 tsp salt to give it a salty kick, then put it in a piping bag. This the first time I’ve made a ‘drip’ cake so I carefully piped blobs of the caramel on the edge of the cake, I was quite stingy with the amount as I knew it would carry on dripping more than I would realise. I then covered the whole top of the cake with a thin layer of the caramel. I put it back in the fridge for 15 minutes to firm up the caramel. 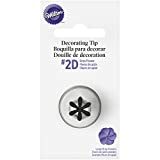 I put the rest of the biscoff buttercream in a piping bag and piped rosettes around the edge using my Wilton Number 6B Open Star tip. I then crushed up some more Lotus biscuits and filled the middle of the Biscoff & banana cake with crumbs. Finally I chopped some pieces of dairy fudge in half and placed them neatly on top of the buttercream. And the Biscoff & banana cake was done! I was pretty pleased with my first ‘drip’ effect cake, as I think it does give a really professional finish. You just have to be as stingy as possible with the amount of caramel, so it doesn’t flood the cake. The cake was a huge hit at work, I had some lovely comments from my happy colleagues on both it’s looks and taste. The banana cake was super moist and full of banana flavour, the crunch between the layers gave the cake some added texture, and the buttercream was pure biscoff heaven! I’m linking this Biscoff & banana cake recipe up with Cook Blog Share hosted this month by Hijacked By Twins, with The No Waste Food Challenge hosted by Elizabeth’s Kitchen Diary as I was making use of 4 ripe bananas languishing in the fruit bowl, and the fudge pieces were also left over from a previous cake decorating session, with Recipe Of The Week hosted by A Mummy Too, with the Sunday Fitness & Food Link Up hosted by Ilka’s Blog and Marathons & Motivation, and with Dessert Island Dish hosted by Good Egg Foodie.